The other day I badly needed a kick to get me through the rest of the day, so I headed over to the gas station to grab my beloved Rock Star fruit punch.Well, what do I see out of the corner of my eye? An entire freezer section devoted to Hershey's Ice Cream (it's a pretty big gas station, it also has a Dunkin Donuts). Anyway, Nick's already reviewed two of their flavors with respectable results, so I think it's my turn to dig in. I'll be honest, I didnt even read the description on this one. I just loved the name and the look of it, so I was a little surprised to see the dark chocolate side... though in retrospect midnight = dark (aka DUH). I am surprised at the light airy texture of Hershey's "premium" ice cream, I was expecting something a bit heavier, though that does explain the $2.99 pint price at a convenience store (half of what B&J or H-D would be). The dark side definitely isn't milk chocolate and I'm not sure how I feel after that. 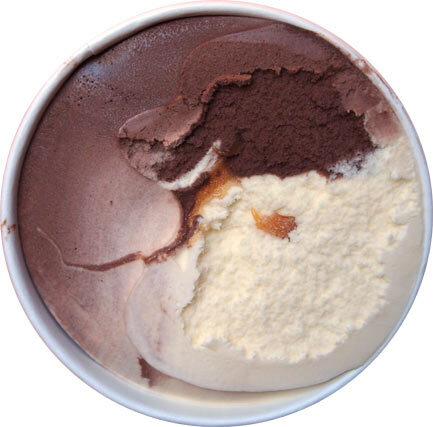 I definitely like the vanilla side, it's very sweet and pleasant though the texture seems lighter than the dark side. The caramel is ooey, gooey, and sweet. Together, it's pleasant and makes me think of some kind of fancy hoodsie cup. Well, I made short work of that, until the second scoop! 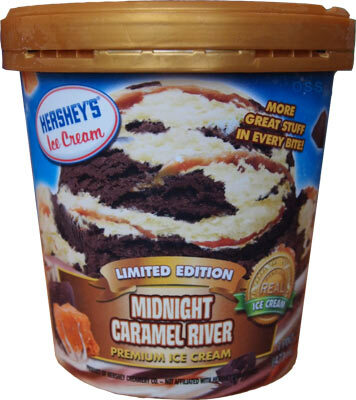 On Second Scoop: Yeah, it appears that the caramel is injected in to the pints as opposed to swirled with the other ice creams. 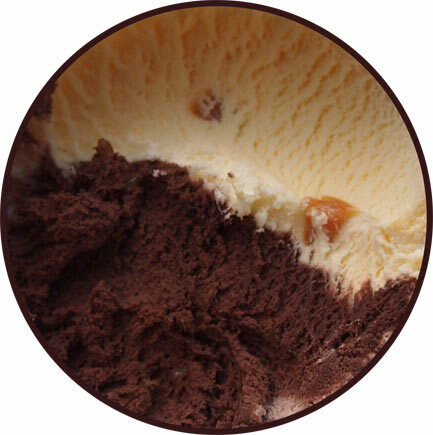 That definitely knocks down the wow factor of something that is kind of misrepresented on the pint design. I don't mean to be rough, but between the light texture and the so-so overall flavor profile of this one, I kind of wish I had only spent $1.99 on this one. Final Thoughts: Before I go, I need to say something. 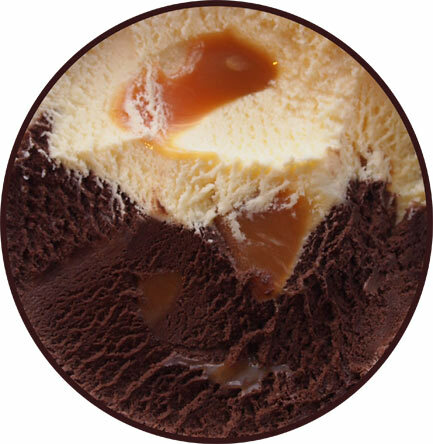 Look, caramel and vanilla is nothing new, everyone does it... but dark chocolate and caramel? That's something special. 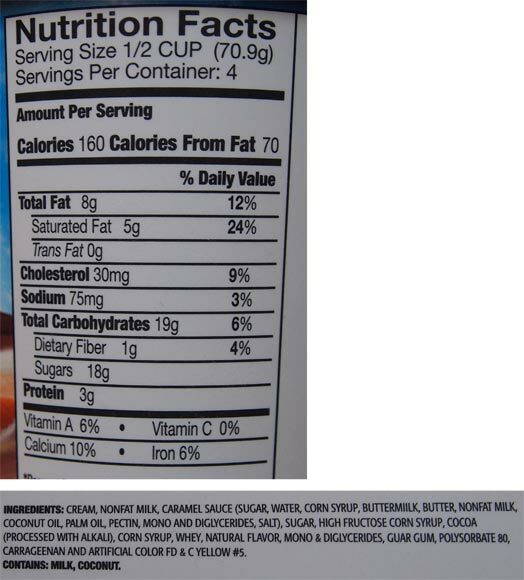 Let's ditch the vanilla altogether, jack up the caramel reserves, and maybe even add some chocolate chips or caramel filled cups. Then we'll have a limited edition flavor worthy of multiple purchases. --- yeah, Nick just reminded me that I just described Denali Bear Claw ice cream more or less.